Possibly the most romantic and easy journey in the UK is to be had on the Caledonian Sleeper Train. Travelling the length of the UK in one evening, you wake in pristine Scottish wilderness. Quite a contrast from your departure in London from noisy Euston station in London at 915pm. If, like me, you are heading for Fort William – be prepared for a long walk at Euston: this is one very long train, which at various points in the murky wee morning hours, splits up to take it's slumbering passengers to various points north – Glasgow, Aberdeen, Inverness … The Fort William section is made up of the front 2 or 3 carriages. Your avuncular 'host' – usually with a fantastically broad Scots accent, greets you at the door to your carriage and shows you to your cabin. They are unremittingly friendly and helpful. The two beds (you can choose either the upper or lower bunk when you book) are a good size, though you might struggle if over 6 feet tall, and are neatly made up with crisp white sheets and duvets. Each room has a pop up washbasin, and the toilets are at the end of each carriage. Everything is sparkling clean and in good order. If you are a solo traveller, you have the choice of a first class cabin, which you don't have to share, or taking the economy class, which you may have to share with someone of the same gender. I took this option, but had the cabin all to myself. I find the clickety-clack of the train incredibly relaxing and was soon lulled off to sleep. 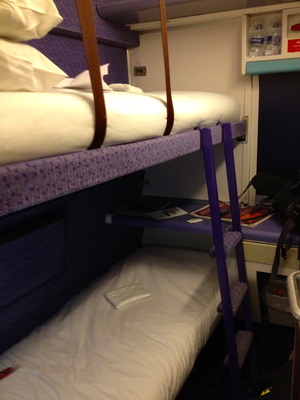 Standard cabin on the Caledonian Sleeper Train - toss for the bottom bunk! There is a first class lounge car, which economy class passengers can use providing it is not too busy – if that's the case, you can order 'take aways' back for your cabin, but the lounge car is the place for getting to know your fellow passengers, and relaxing with a reasonably priced snack from the limited menu, and a drink or tea and coffee. In the morning, depending on where you are heading, you awake to the calm and beauty of the Scottish countryside. For me, it was wild Rannoch Moor, where dozens of wild deer were grazing in the wind-swept snow. At 8am, your host awakens you with 'tiffin' – tea, coffee and some Scottish shortbread, or a continental breakfast (GBP4 extra). I arrived into Fort William just before 10am, refreshed and ready for a walk in the hills, before jumping on the famous 'Road to the Isles' train to Mallaig, which winds across the magnificent Glenfinnan Viaduct, made famous in the Harry Potter films. I've done this trip from London on a number of occasions, leaving on Friday night and returning on Monday morning, for a really relaxing walking weekend in Scotland, but also for longer breaks. It's definitely my favourite trip in the UK. Sleeper tickets to Scotland and beyond can be booked up to three months in advance, and if you are really on the ball, you can sometimes pick up great value 'bargain berths' in advance from just GBP19 each way, including the sleeper berth. 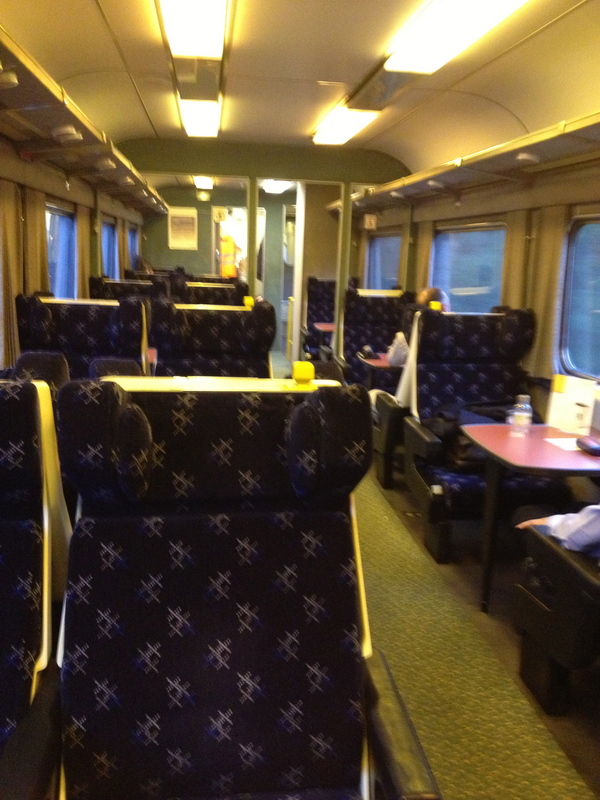 Prices do vary widely, so best to get onto the Scotrail website and check. Sleepers are a great way to travel! We once took the couchette from Paris, France down to Nice. So nice to wake up to palm trees. Hope to see something of Scotland some day.